Today we bring to you a review of a product that won’t even be fully launched until sometime next year. 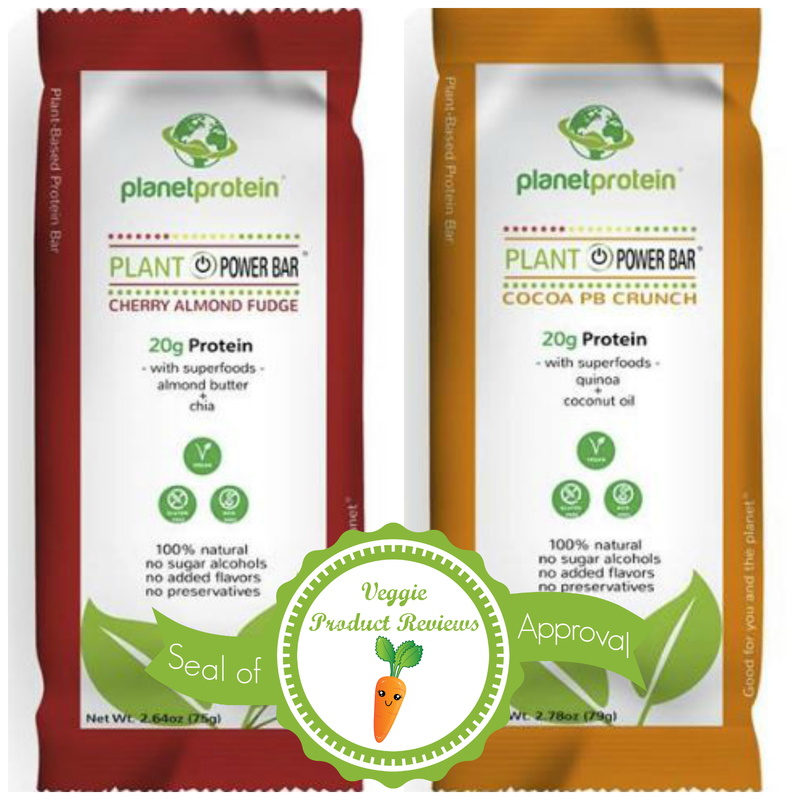 But, Planet Protein was kind enough to offer us a bar each of their two flavors in exchange for an honest review. You can purchase them in pre-launch from the Planet Protein Facebook Page. The texture reminded me a lot of the old school Power Bars: chewy, a little gritty/chalky. I don’t mean that in a bad way. I really liked the texture of Power Bars and have missed them. So, if you’ve been missing them too, here’s your vegan replacement! Cherry & Peanut Butter varieties? Yes, please. They’re both lightly sweet. You wouldn’t confuse them with candy, but that’s not what Planet Protein sets out to be. They’re a little spendy. From what I can tell MSRP is $3.50 per bar when purchased individually. But, that’s the tradeoff for supporting small business and healthful products so I didn’t ding it in the grade for this. The cherry got an A- instead of an A because I’d like just a little more cherry flavor. The texture was also just a tiny bit harder than the PB which I thought was perfect. Happy Saturday, everyone! When I read the Vegan MoFo prompt for today was writing about my favorite cookbook, I immediately thought I should write about Appetite for Reduction. It’s full of hearty, healthy recipes made from real food and are pretty easy to make. Some of my favorite dinner recipes come from that book, including Arabian Lentil & Rice Soup and Unfried Rice, so clearly that must be my favorite cookbook. But then I took a good, long look in the mirror (figuratively) and realized if I wrote about Appetite for Reduction, I’d be a big ol’ liar. You can see the truth about someone by looking at how they live, not by listening to what they say. 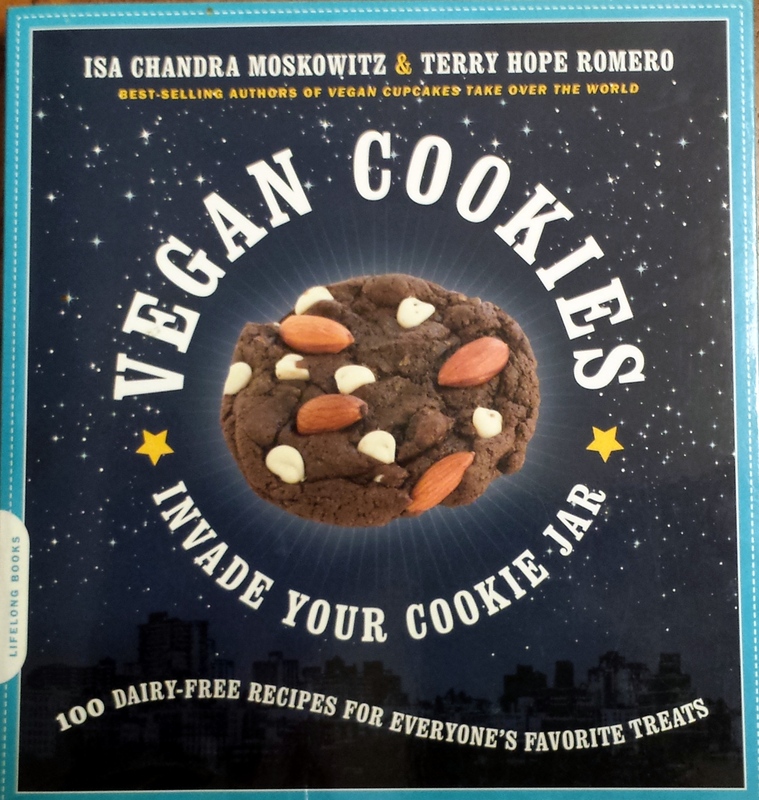 So, if you were to take a look through my cookbooks and checked for the number of recipes I’ve used and repeated and the number of pages that are stained from being dripped on, you’d find that my actual favorite cookbook is Vegan Cookies Invade Your Cookie Jar (VCIYCJ) by Isa Chandra Moskowitz & Terry Hope Romero. You see, I have a very specific sweets hierarchy. From the bottom up, it’s cake, pie, candy, ice cream and way at the top is cookies. 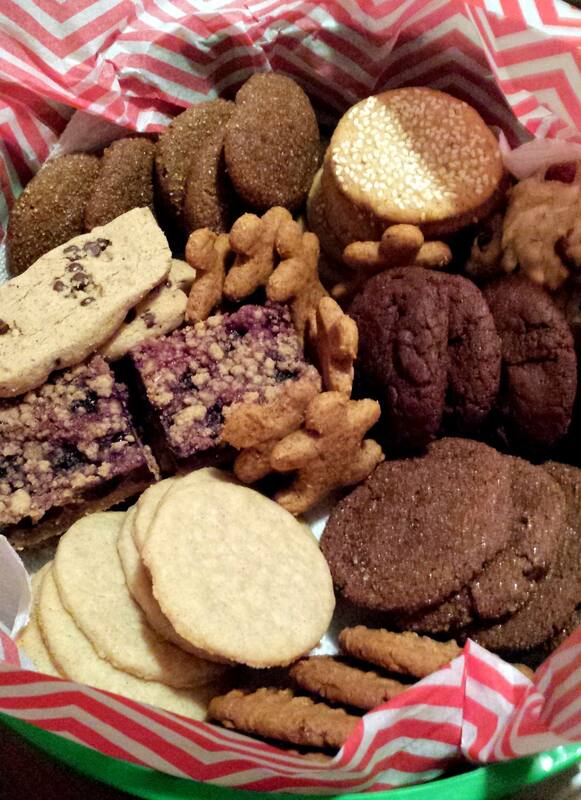 When you’re vegan and have allergies to gluten and soy, good cookies are hard to come by. VCIYCJ and some experimenting with gluten free flours changed all that for me. My sister and I now have a big pre-Christmas baking day where we bake about 15-20 dozen cookies of all different kinds. There are people who wait for their basket every year now and get so excited when delivery day arrives. VCIYCJ doesn’t just sit around waiting for the holiday season. While I don’t bake a ton just for me, for pretty much any occasion I’ll say “I can bring cookies” Any excuse will do to try a new cookie or to break out a favorite. This week I had three reasons! It was time for another product review, it was my 8 year veggieversary, and my office just moved and I’m trying to take a little something for each of our new neighbors to help form good relationships…cookies fit the bill for all of those. I recently had my food allergies/sensitivities retested and after several years, I no longer have a sensitivity to oats. Hello, reason number four: oatmeal cookies! I went to my trusty (and might I say adorable) VCIYCJ in search of the proper recipe. VCIYCJ is not just filled with yumminess, it’s so cute with it’s glossy cover and nearly square format. She’s got two equally adorable sisters that focus on pies & cupcakes. In case you haven’t figured it out yet, the reviewers here at Veggie Product Reviews are big peanut butter fans, and we’re always ready to try a new one. Could it be that VCIYCJ even has a peanut butter oatmeal cookie recipe? YES, it does! 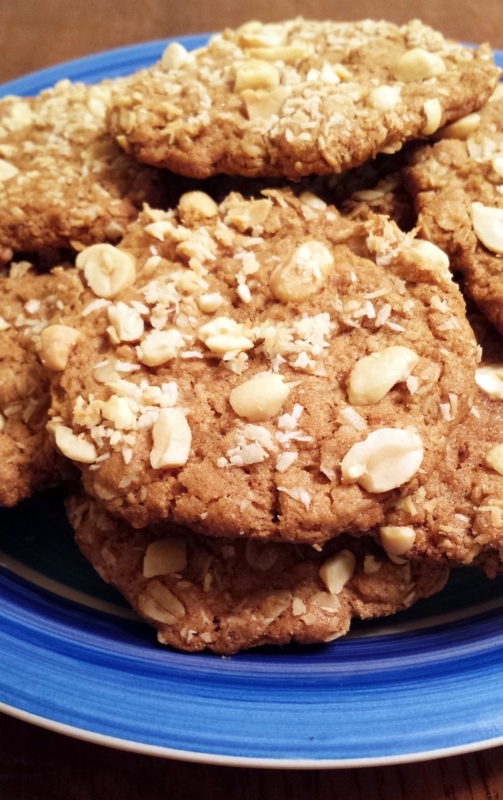 No fancy name for them either… just Peanut Butter Oatmeal Cookies. If you haven’t purchased this book yet (why? ), you can find the recipe in the Amazon “Look Inside” feature on the book’s listing. 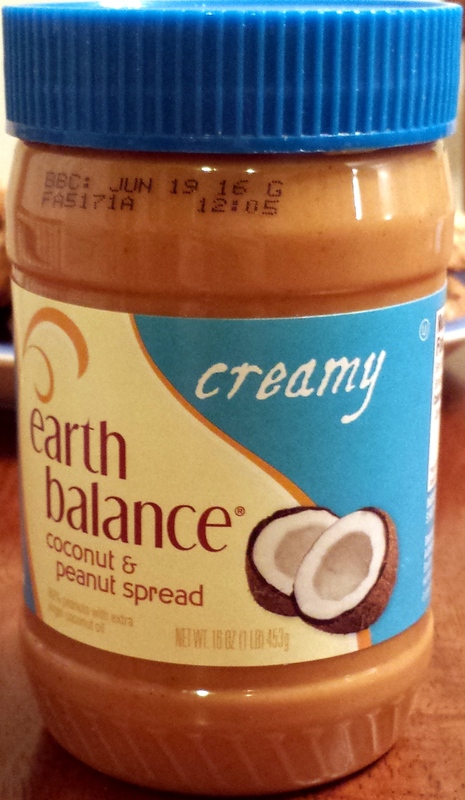 I picked up a peanut butter that is new to me: Earth Balance Coconut Peanut Spread. I tasted it in my typical manner of eating peanut butter…on a spoon. I had a little brain/taste bud disconnect at first because it looks like peanut butter but it tastes like coconut. I moved past that pretty quickly because I actually really like peanut butter and coconut together. My only complaints in eating it this way were that it felt a little dry (nothing a drink of water wouldn’t cure) and occasionally I got small sugar granules instead of a perfect creaminess. I also tried it sandwich style (ok, it was a folded over pancake) with a little jelly. It was delicious this way. The coconut wasn’t overpowering and I didn’t notice the little problems I’d had earlier in texture. But, in these cookies, oh, in these cookies…this peanut butter was exactly perfect. They would now be Peanut Butter – Coconut – Oatmeal Cookies. Oh, I’m there. It’s super simple, use the original recipe* and just replace the regular pb with the Earth Balance Coconut & Peanut Spread, leave out the cinnamon, and add some unsweetened shredded coconut to the chopped peanuts for the topping so people will know what they’re getting. They are getting a cookie that is crispy, almost caramel-y from the brown sugar, coconutty, peanutty and altogether delicious. While the Earth Balance Coconut and Peanut Spread won’t replace plain peanut butter in my pantry, it has won a spot right next to it if for nothing other than baking. *If you’re gluten free like me, the flour mixture I used that worked so well is 2/3 cup of sorghum flour (my go to when whole wheat pastry flour is called for), 1/3 cup brown rice flour, 2 Tbsp Arrowwroot and 3 Tbps Potato Starch. Sometimes what makes a meal good isn’t really about how fancy it is. It’s not even all about what it tastes like. Sometimes it’s about how it makes you feel. Before the days of thermal bags and ice packs going on to the school bus each morning, we had to have things that wouldn’t spoil before the lunch bell. For most of us that meant a good ol’ pb&j. I understand that, for you, 30+ years later, a peanut butter and jelly sandwich may be completely pedestrian. 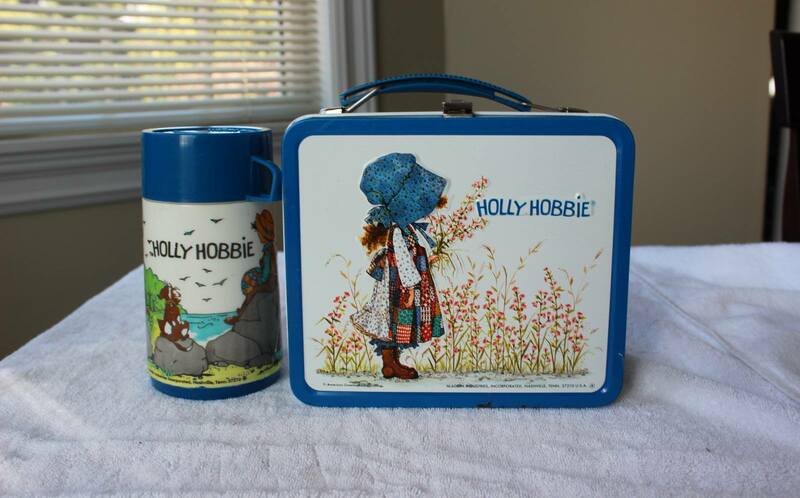 But, for me, it brings back sweet memories of the many, possibly hundreds, of pb&j sandwiches that my mom packed in my Holly Hobbie lunchbox. Even though Mom prefers creamy peanut butter, she almost always used extra crunchy because that’s the way I like it. Those sandwiches were most often accompanied by a red delicious apple and a thermos full of milk. They were always packed with a lot of love. 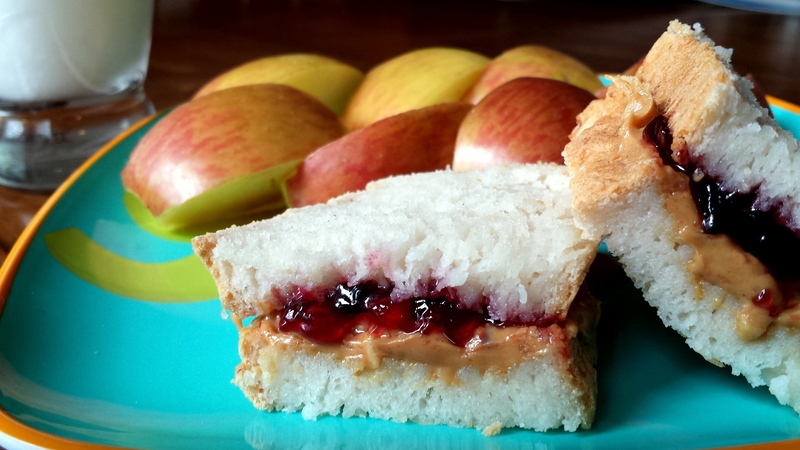 The key to a good pb&j is soft, squishy white bread. Don’t toast that stuff. It makes my peanut butter melt, and I hate that. Being vegan, gluten free and soy free (both because of allergies) for the past 8 years means that I haven’t had a “real” pb&j in 8 years. The only bread I’ve found that I could have is really only edible when toasted. I would give almost anything for soft, untoasted bread. 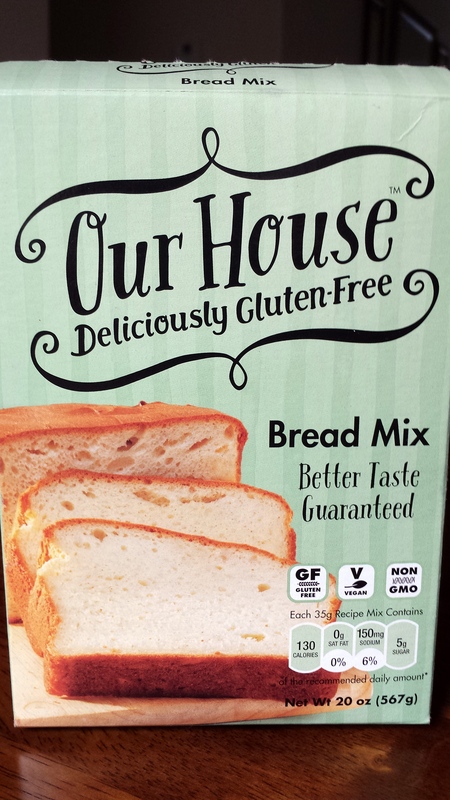 Enter Our House bread mix. I found it at a local IGA (thanks, Carlie C’s), but I hear the brand is available at other places too. The directions called for a stand mixer with a paddle attachment. I don’t have that, but I decided to test it out with what I do have – a handheld mixer with mini dough hooks. All went as the directions said it should. I let it rise for about 60 minutes and then baked about 50 minutes. I don’t have a thermometer to check internal temperature – which I thought was weird in directions for bread, but I’m not much of a baker so maybe it’s common. But, it was done. It was sooooo hard to wait to cut into that loaf. It smelled sooooo good. It was worth the wait. The bread had a lightly sweet yeast bread flavor. My only complaint was that it was a little dense because it didn’t rise enough to be soft and squishy. Once I put the pb&j on it though, the denseness wasn’t as noticeable. The only real problem I had in recreating my elementary school lunch. was what was really a “whole” sandwich, looked like a half sandwich. So, my review is this. If you’re vegan and gluten free and have a hard time finding soft bread, this is definitely worth your time. If you’re not gluten free and have access to a soft, white bread, it’s a toss up. It’s yummy, but you might like the texture of yours better. I’ve changed to a fuji apple and non-dairy milk. But other than that, this is super close to what mom used to make. After 8 years of waiting, Our House bread mix helped me to get a pretty darn good recreation of the best sandwich ever. Thanks, Our House, for making an appearance at my house. We are on a MoFo roll! It’s Day 4 and we are going strong. Today’s theme is to tell our readers about a weird food combination you love. Say no more! They had me at weird. I’ve been known to eat some strange food combinations. As a kid, I had a talking cabbage patch doll that said that she liked chocolate ice cream with pickles on top. Most kids probably gagged at that, instead I begged for it. And I loved it. Some of my other weird food combos were hot sauce on ice cream, corn snacks/chocolate sauce/bacun bits all together (drool! ), fritos with cream cheese, peanut butter sammies with potato chips, ketchup on literally anything, to name a few. Probably the weirdest food combo that I still eat today came to me as a five-year-old. I was at the neighbors having lunch and they offered me a sandwich. The mom said she’d make me what is quite possibly the best sandwich I’ve ever tasted. This woman was nothing short of a culinary genius. She offered me white bread, peanut butter and dill pickle chips. Yes! Hold the phone…I did just say dill pickle chips. I took one bite and fireworks went off in my little kiddo brain. I gobbled up the whole thing and then ran home to tell my mom. I got this sandwich many days in my lunch. I learned as I got older to put the pickles in a baggy so they didn’t make your bread soggy. People tease me about this sandwich, even my husband John did. I could care less because they are missing out on a culinary delight. John FINALLY tried this sandwich a month ago and guess what?!?! Fireworks went off for him too. He loves it! He finally gets it. 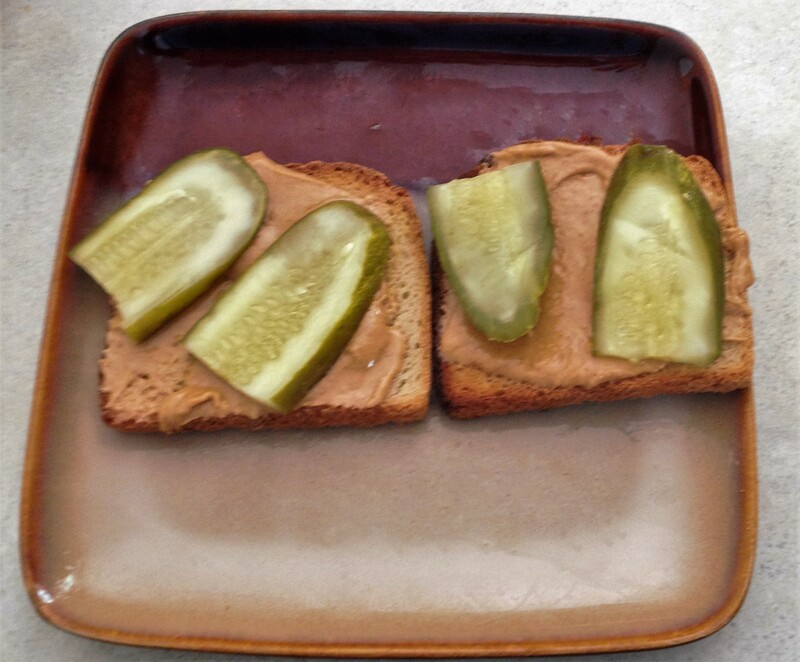 We make our sandwich with 365 brand peanut butter and Claussen pickles, cut into slices. I will not give a shout out to the bread in this picture as it is a gluten free bread that isn’t all that good. The market seems to be severely lacking in good tasting vegan gluten free breads. I can, however, promote the other two components in the sandwich- pickles and peanut butter. I enjoy the 365 brand of peanut butter because there are two ingredients: peanuts and salt. There aren’t sugars or chemicals. It is a simple product that tastes like peanut butter should, chemical free. 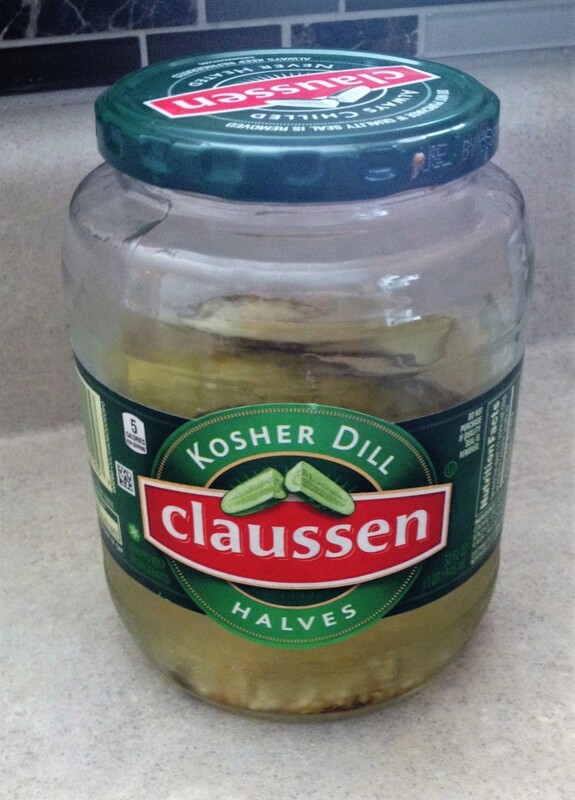 Claussen pickles can be a bit on the salty side, but if eaten in moderation they don’t make me too thirsty. They have a nice crunch, which is what I look for in this sandwich. I’ve tried other pickle brands and peanut butters, but this combination is the best. I know I have you salivating now. Just try to make it stop. Happy MoFoing!